It's one of the first things we learn as kids: how to share. But this practice usually fades as we become adults. Our houses become filled with our own “stuff.” When we need something, our first thought is to go out and buy it. Garages, attics, basements, and closets transform into cluttered warehouses. But does it have to be this way? 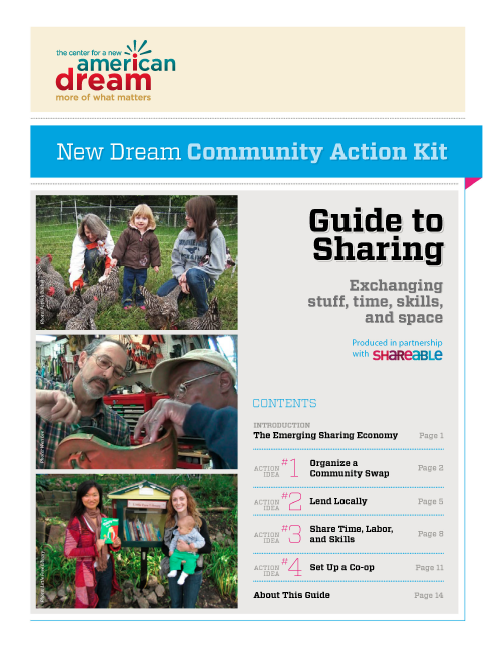 The first guide in New Dream's Community Action Kit is all about sharing: everything from starting a tool library to organizing a solar cooperative, from holding a clothing swap to launching a time bank. With how-to tips, fun videos, and useful resources, the Guide to Sharing provides the inspiration and practical tools you need to get started on these projects in your community—right away! Do you find the Guide to Sharing useful? Have you tried our project ideas in your community? Please email us to share your stories, questions, tips, and other feedback. The Guide to Sharing is part of New Dream's Community Action Kit, a series of free online guides to help people organize collective action and civic engagement to build more sustainable, healthier, and happier communities. > > > Like this guide? You'll also love our Guide to Going Local!